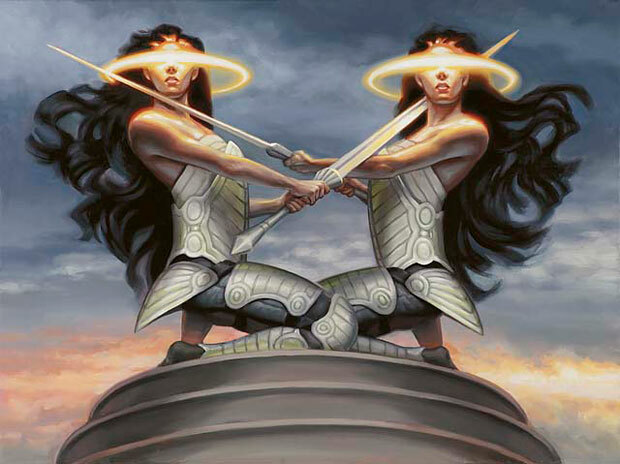 When I first started playing Magic, as many readers may already be aware, I was a huge fan of defensive-minded decks which defied any attackers from gaining traction. Cards like Island Sanctuary, Righteousness, and Castle backed up by Blue countermagic helped surround me in a virtual fortress, along with a fair number of Walls. I might win through a finisher like Air Elemental, or get clever and drain them out with their own cards via Psychic Venom, Power Leak, Creature Bond, or Feedback. In multiplayer play, I wanted to be the guy no-one attacked, instead moving on to easier and softer prey. Now moving forward many years to the present day, we find a similar spirit prevailing in the new Commander deck Political Puppets, the last to be reviewed and the one that has me the most intrigued. ‘Group Hug’ strategies have long been viable in the format- decks which take a ‘friendly’ approach to the game giving everyone free cards and other goodies, all the while looking to avoid being a target through excessive generosity. The premise to Political Puppets is simple, but one that has a most unusual twist. Unlike the other four, which have strategies that rely on your skill in the game- this deck also needs a healthy dose of personality to be at its best. Ruhan of the Fomori is quite the opposite. A blind, massive 7/7 for only four mana, Ruhan comes with something of a ‘drawback’ in that he must attack each turn if able, and his target will be at random. This might not seem at all political on first blush- who wants to make enemies at the table by smashing face with a 7/7? But therein lies his subtlety- players who are the target of random effects are typically far less prone to holding a grudge. Play it the fun factor of his unpredictability, and you’ll find that even he has a certain comic value that might make some players hesitate in pulling the trigger on him, or singling you out for unpleasant attention. Finally, there is the Numot, the Devastator. Included by colour identity, not theme, you won’t find Numot to be as good a fit as a commander in this deck, as the only real political angle he gives you is, whose lands do I destroy? Still, it’s a potent ability, and one that’s perfectly fine when drawn in the actual deck rather than when acting as your commander. Political Puppets isn’t foolish enough to rely solely on goodwill as a guarantor of self-preservation, but much of the deck uses tactics that are designed not to provoke the ire of others. A number of your security measures are passive in nature, although the deck is certainly capable of handing out the odd beating when diplomacy isn’t going your way. We’ll continue our analysis by exploring the main themes of the deck, discussing both creatures and noncreature cards which support it. Dissuasion: One of your strongest strategies, dissuasion covers those cards which don’t eliminate your enemies’ threats from the board, but rather give them good reason to point them at someone other than you. One such way is to make them pay a premium in mana for engaging in aggression against you. Propaganda, Ghostly Prison, and the Windborn Muse all do the same thing- any player must pay for each creature they want to send knocking on your door. It’s not a lot of mana, but it certainly can add up, or prevent them from doing other things. Crescendo of War is a very subtle trick- on the surface, it looks like an ‘everyone benefits’ card, and to a degree this is true. But because it affects all attacking creatures, but only your defending creatures, you come out slightly ahead on the deal. Your rivals might think twice about the high cost you could make them pay if they send their troops across the red zone. Another way to do this is to show them that bad things will happen if you are forced to defend yourself. The False Prophet promises a wipe of everyone’s creatures, and makes a very persuasive chump blocking threat. Martyr’s Bond does much the same, promising shared grief if someone singles you out for an act of unprovoked aggression. Finally, there’s a Soul Snare included in the deck, which is more added incentive to leave you in peace, lest their best attacker find itself removed from the game. A third method is to simply throw up some mighty walls, to show your opponents that attacking you is futile in the first place. The Wall of Denial certainly ranks amongst the best, but there’s also a Gomazoa and Guard Gomazoa, a Wall of Omens, a Fog Bank, and a Plumeveil. Though we might have liked to have seen some of the Stronghold walls appear here, one can hardly argue with the assortment. Bribery: Let’s face it, many players can have their affections purchased in the course of a game, for who doesn’t like getting something for nothing? And who’s going to want to be the killjoy that tries to derail the fun train? One of the easiest gifts for Political Puppets to make is the gift of free cards. Whether it be a steady effect like Howling Mine or Nin, the Pain Artist, a one-time gift such as from Vision Skeins or Trade Secrets (which is also asymmetrically generous), or something that can be either (Skyscribing), there are plenty of ways here to win friends and influence people. Nin is an especially intriguing option because of her versatility- she can go offensive and kill off a particularly nettlesome creature, or you can use her as a recurring card engine, damaging your (or other players’) creatures just a little to get a free card or two. 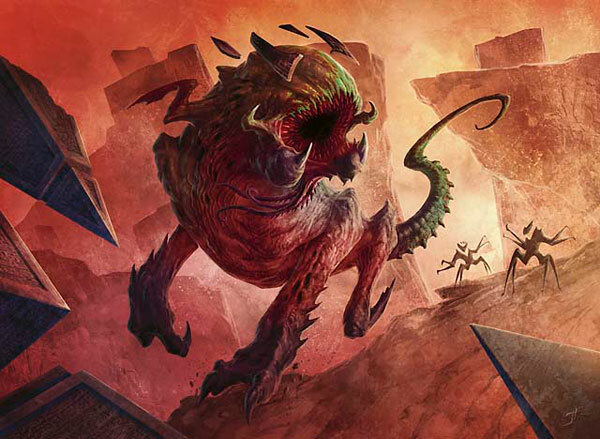 The Arbiter of Knollridge will win you the gratitude of the nearly-vanquished when it touches down on the table (or even give you a second lease on life). Death by Dragons will be good for a laugh as you get to single out one unfortunate soul to take on the role of Eldo in the flavour text. Finally, the Spurnmage Advocate can provide an extremely powerful source of assistance, killing off attacking creatures while letting you give away gifts from the graveyard- a strong way to ‘keep the peace’ at the table. Donation: In addition to Zedruu’s own ability as discussed above, there are a trio of creatures in the deck that facilitate the sharing of ownership of your permanents. The Chromeshell Crab allows you to swap creatures once you unmorph it- and note that as your only morph creature in the deck, its identity will come as no surprise to anyone familiar with this decklist. The Vedalken Plotter swaps lands when it enters the battlefield, and finally the Goblin Cadets have the ability to donate themselves. Unable to die in combat due to its triggered ability, these should have sme fun making the rounds until they finally land at the doorstep of a player who has sac outlets. Whoops! Countermagic: A Scattering Stroke, reminiscent of the classic Mana Drain, not only acts as a counter to your enemy’s nastiest spell, but it gives you the chance to add to your mana pool. In the post-mana-burn world, this is all upside. Meanwhile a Spell Crumple acts as a hard counter which sends the countered card to the bottom of the library rather than to the graveyard. This is especially insidious when the countered spell is an enemy commander! Flusterstorm has been touted as the storm-killer, forcing its victim to pay an additional mana for every spell they’re hoping to resolve. Making the most of it is tricky and conditional, but it has tremendous potential to thwart your enemy’s carefully-laid plans. Finally, Wild Ricochet is less a counter than a redirect, but it has the ability to either turn aside enemy removal, or even steal a buff they were intending to put on their own creature. Removal: The removal package in Political Puppets is more robust than your opponents might expect from such a soft-power strategy. 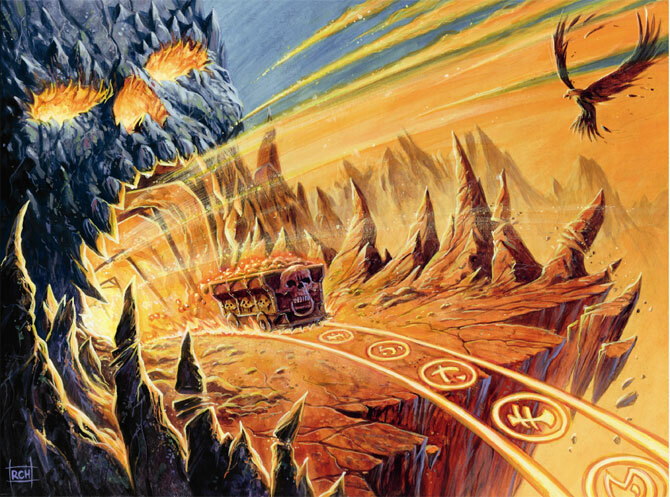 There’s a small burn suite (Flametongue Kavu, Lash Out, Breath of Darigaaz, Punishing Fire), targeted removal (Prison Term, Chaos Warp, Oblation, Journey to Nowhere), bounce (Repulse, Whirlpool Whelm), the Vow cycle of buff/removal (Duty, Flight, and Lightning), and a boardsweeper in Austere Command. Many of these cards have additional ‘political’ elements. Look at Oblation- not only does it remove a nonland permanent, but it also nets that permanent’s controller two cards. You could use this on an opponent’s creature which is about to die anyway and turn misfortune into happiness- always be on the lookout for the upside offered in Political Puppets– it is not without its subtleties. The rest of the deck’s cards are more or less smaller clusters of like effects. You have some utility beaters in the Rapacious One, Dominus of Fealty, Jötun Grunt, and Brion Stoutarm. 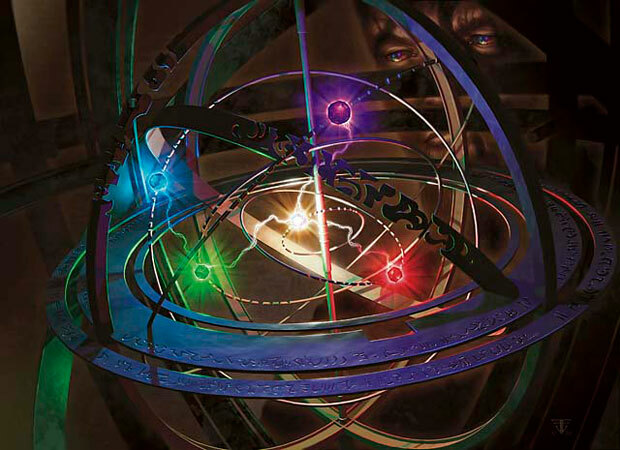 There’s some extra card draw in Perilous Research, Brainstorm, Murmurs from Beyond, Izzet Chronarch, and Court Hussar. There are two brutal mass-theft cards in Insurrection and Reins of Power, which can line up alpha strikes against unsuspecting opponents. A Pollen Lullaby can stifle an enemy attack, and not necessarily one directed at yourself. Lightning Greaves are de rigeur for the set, helping you keep your commander from harm’s way. An Azorius Guildmage is another card that can help ‘keep the table’s peace,’ and the Champion’s Helm is another way to keep your commander (or another legend) safe from harm. Political Puppets has a much smaller array of nonbasic land than the other decks appear to. Here you only have the cycle of Ravnica bounce-lands (Azorius Chancery, Boros Garrison, and Izzet Boilerworks), a pair of fetches (Terramorphic Expanse, Evolving Wilds) and a Command Tower. To augment this, you have a more substantial number of artifact mana sources. You have of course the Sol Ring (one per deck), but there’s also a Fellwar Stone and Darksteel Ingot for extra coloured mana and a Dreamstone Hedron for colourless. A Prophetic Prism acts as a filter, and an Armillary Sphere does its work through land-fetching. All told, here are the two mana curves for the deck. As you’ll see, Political Puppets quite happily lods up the earlier end othe mana curve to give you plenty of options- there’s nothing political about a string of draw-go turns which do nothing to advance your aims. The next review will be our final installment of the Commander series. We hope you’ve enjoyed reading them as much as we’ve enjoyed writing them. See you in two days’ time! I just love this deck. Already meddling mine. I wouldn’t say it only by seeing the commander, but i think this is my favourite deck from all the five! Martyr’s Bond is pretty awkward with Zedruu since they can sac the guys you donated.